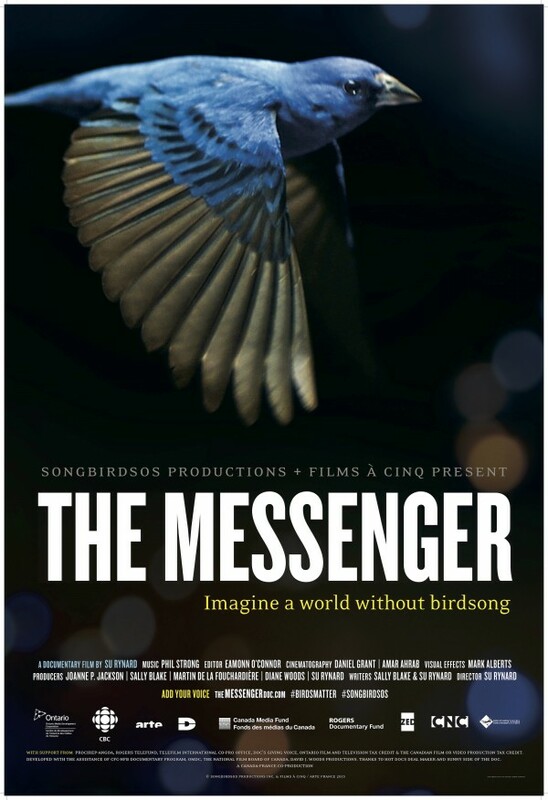 Posted on December 2, 2015 by Hillary T.
Join Wayne Petersen, Mass Audubon’s Director of Important Bird Areas Program, and Joan Walsh, Mass Audubon’s Director of Bird Monitoring, on Thursday, December 3 at 7:30 pm for the Massachusetts premiere of the new documentary The Messenger: Imagine a World Without Birdsong at The Regent Theatre in Arlington as well as a post-screening discussion. For thousands of years, songbirds were regarded by mankind as messengers from the gods. Today, these creatures—woven inextricably into the fabric of our environment—are vanishing at an alarming rate. Under threat from climate change, pesticides, and more, populations of hundreds of species have dipped dramatically. As scientists, activists, and bird enthusiasts investigate this phenomenon, amazing secrets of the bird world come to light for the first time in this acclaimed and visually thrilling documentary. Find out what’s killing our songbirds, and what can be done about it. As in ancient times, songbirds may once again be carrying a message to humans—one that we ignore at our own peril. Watch the trailer at the official film site. Wayne R Petersen is Director of the Massachusetts Important Bird Areas (IBA) Program at the Mass Audubon. He was the Field Ornithologist at Mass Audubon for 15 years before assuming the position of IBA Director in 2005. As co-author of Birds of Massachusetts (1993) and co-editor of the Massachusetts Breeding Bird Atlas 1 & 2 (2003, 2013), his knowledge of the habitats, distribution, and status of the Commonwealth’s bird life is both extensive and wide-ranging. As a New England Regional Editor for North American Birds magazine and editor of the New England Christmas Bird Count for National Audubon, Wayne’s knowledge of the seasonal distribution of New England bird life give him a wide perspective when thinking about Important Bird Areas in Massachusetts and beyond. In 2005 Wayne was the recipient of the American Birding Association’s Ludlow Griscom Award for outstanding contributions in regional ornithology. Joan Walsh has been watching, and learning from, birds for 35 years and has been the Director of Bird Monitoring at Mass Audubon since 2006. During her career she has focused on research that has direct implications for bird conservation. This interest led to enlisting hundreds of citizen scientists for the creation of the highly regarded Massachusetts Breeding Bird Atlas 2 and two State of the Birds of Massachusetts reports. She was a Farallon Island biologist where she studied Elephant Seals, Tufted Puffins, Brandt’s Cormorants, Western Gulls, and even did a little Great White Shark work. She went to graduate school in Georgia, where she studied Wood Storks, and was the former Director of Research at Cape May Bird Observatory in NJ. Her formative years as an ornithologist were spent on Great Gull Island, NY, home to the largest colonies of Common and Roseate Terns in the North Atlantic. This entry was posted in Special Events on December 2, 2015 by Hillary T..